Can Faustino is a 16th century palace that has been renovated over the centuries and transformed into a luxurious 5 star accessible hotel offering 21 rooms and 3 suites. At the hotel guests can enjoy spectacular views overlooking the ancient harbour, high quality attentive service and relaxing facilities such as spa and massages. Hotel Port Ciutadella is located in Ciutadella, a charming town on the west coast of the island. Noted for its location as it is located in a quiet area near the sea front Platja Gran and at the same time, a short distance from the city center. 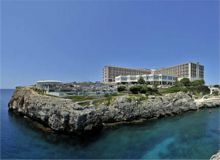 Situated in an elevated position on a cliff front, this hotel enjoys impressive views of Ciutadella bay and Cala 'n Forcat. This hotel offers something for everyone wether you want to soak up the sun by the large swimming pool or take part in the extensive entertainment programme. 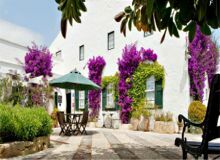 Biniarroca Hotel is one of the most tranquil places in Majorca, Sant Lluís ideal for those wishing to relax and unwind and / or looking for a romantic accessible holiday. The accessible accommodation features natural pools, beautiful gardens, massage area etc at the hotel’s restaurant.